The best source for finding past obituaries of Portage County residents is the online Obituary Index which is now part of the Central Wisconsin Genealogy Index. It indexes the largest of the Portage County newspapers - the Stevens Point Journal (both daily and weekly) and the Gazette (the original and the current). We also have full text obituaries from The Wisconsin Pinery (1853-1890) and The Plover Times (1866-1881). These are not indexed in the Obituary Index so you may want to check them out if you do not find who you are looking for using the Index. And, a current project we are working on is to index all the smaller newspapers from the county. This would include not only Stevens Point papers, but various newspapers from Amherst, Almond, Junction City, Plover, and Rosholt. Click here for what we have indexed to date. For current obituaries, check out the Portage County Gazette. If you do find an obituary through the Obituary Index and you are a Wisconsin resident, you may be able to access it online through Badgerlink. Badgerlink contracts with vendors to provide access to large volumes of full-text information. One of those vendors is NewspaperARCHIVE. 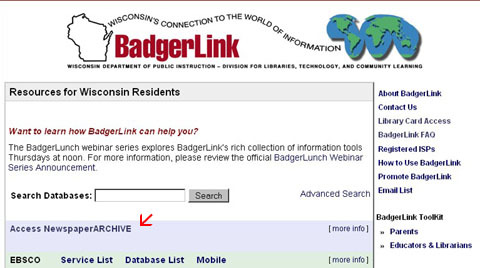 To get to NewspaperARCHIVES click on Badgerlink and then "Access NewspaperARCHIVE". And finally, we have full text obituaries that have been submitted by volunteers.